Out in the Hills is Tim Hall, who has been walking extensively in the hills and mountains of the UK since discovering the Peak District as a boy living in Manchester. He went on to explore the Lake District and Snowdonia, before moving to Scotland 20 years ago and becoming well acquainted with the Highlands. Tim is now based in Aviemore, and is frequently out and about in the Cairngorms National Park. He set up Out in the Hills in 2010, and has been enthusiastically sharing his knowledge and experience on day walks and multi-day treks since then. Out in the Hills provides a bespoke service, so the walks and treks are tailored to your requirements, whether it's a day in the Cairngorms or a multi-day trek into the remote North West Highlands. 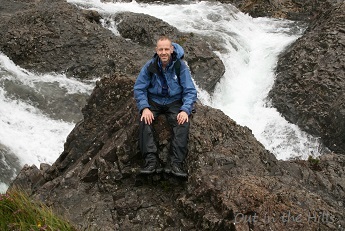 Tim is a qualified Mountain Leader under the Mountain Training scheme. This is the nationally recognised qualification for taking individuals and groups mountain walking in the British Isles, and he keeps up to date and increases his knowledge by means of Continuing Professional Development, with a variety of courses and workshops. Out in the Hills has also been awarded accreditation by Adventuremark (Click here for information about Adventuremark). 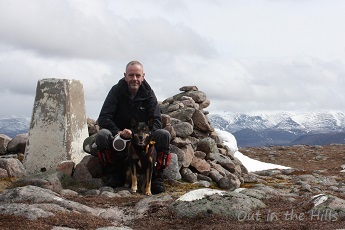 He has climbed all the Munros (the 282 Scottish hills over 3000ft) twice, as well as many other hills, but is equally happy exploring coastal walks or discovering remote glens. He has also been trekking in Ireland, the Pyrenees, the Dolomites, and New Zealand. He is also qualified as a First Aider and is experienced as a volunteer with St Andrew's First Aid. He has helped provide First Aid cover at events ranging from the Royal Garden Party at Holyrood Palace and the Six Nations rugby matches at Murrayfield, to the Beltane Fire Festival and the world-famous Edinburgh Hogmanay Street Party. Tim is also a keen astronomer (with a degree in Astronomy), and on a wild camp, miles from any street lights, the night skies can be spectacularly clear. If we get a clear night, he will point out the interesting things we can see in the sky: stars, planets, galaxies, meteors, the International Space Station, and - if we're very lucky - the aurora borealis (northern lights). In the spring and autumn months, overnight treks can be designed specifically in the hope of seeing the aurora, although it can never be guaranteed.